TV5 is also set to make a reunite two of Philippine Tv's best actresses - Alice Dixson and Lorna Tolentino. 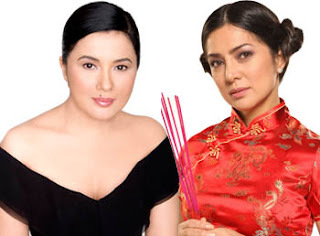 After her ABS-CBN's Minsan Lang Kita Iibigin, Lorna Tolentino will jump over to the Kapatid Network to do her first ever teleserye in TV5. This will also be her second teleserye to star with Alice Dixson. The two drama stars top billed GMA's teleserye before, Hanggang Kailan. With a working title Glamorosa, TV5's next teleserye seemed to be patterned from ABS-CBN's Magkaribal. Nevertheless, with a show top billed with this cast, Glamorosa will surely be another hit for the Kapatid Network.